PECO MODEL RAILWAY - OO GAUGE. ALL POINTS MOVE MANUALLY. Hornby Dublo 2 rail oo gaugeNickel Silver not steel Left hand Electric Point in excellent working order. All fish-plates present. Unit is a little rusty but no broken sleepers. Seems to work correctly. Code 100 Insulfrog. Peco Streamline SL-89. Large Radius Left Hand Point. OO/HO Gauge. Hornby, R8072, Standard Left Hand Point - BRAND NEW. PECO STREAMLINE MEDIUM RADIUS LEFT HAND POINT `00` GAUGE CODE 100 RAIL INSULFROG SL-96 The `happy medium` ideal for use on most layouts. Length 219mm (85/8") Nominal Radius 914mm (36") Crossing angle 12 deg. In used condition and untested; the switching action seems positive and appears to hold in each direction. HORNBY -OO/HO Gauge, Nickle Silver rail, 2-Rail - Unused, R8072 LEFT HAND POINTS and R8073, X2 RIGHT HAND POINTS - boxed. MPN: R8072, R8073. Item: X3 Left Hand & Right Hand Points. Condition: The points are unused, complete, clean, boxed. Hornby OO Gauge R8072 R/H X4 R8073 L/H X4 Points Excellent Clean Condition. N0.2 Radius Turnout R:438mm A:22.5 degrees L:168mm Left hand. Scale / Type: OO Scale. We will always help you to have a 100% positive happy buying experience. Our Code: PEST-241. Part Number: ST-241. Hornby Left-hand Standard Point (R8072). Standard left-hand orientation silver nickel plated Hornby points. Length 168mm radius 438 arc 22.5°. Hornby points are supplied for operation by hand. A staple of OO gauge layouts - a left-handed set of points. 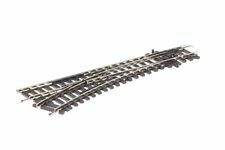 Peco Streamline SL E89 Left Hand Large Radius Turnout HO/OO Nickel Silver. Peco SL-E192 Code 75 Electrofrog Left hand Turnout, small radius (OO gauge) Small radius left-hand turnout. Nominal radius: 610mm (24in) Angle: 12º Length: 185mm (7 9/32in). OO gauge Code 75. Small radius left-hand turnout. PECO STREAMLINE LARGE RADIUS LEFT HAND POINT `00` GAUGE CODE 100 RAIL INSULFROG SL-89 The last word in scale realism. Wherever space permits, these are the points to use. Length 258mm (101/8") Nominal Radius 1524mm (60") Crossing angle 12 deg. HORNBY R612. MAY VARY FROM ONE PICTURED. Get In Touch. Important Information. WORKING ORDER: Yes. 2nd Radius Left Hand Turnout. Nickel Silver Rail. Has been cleaned and tested with my worst loco. Damien Jurado ‎– Waters Ave S. - ORIGINAL JEWEL CASE & ARTWORK (#273770516883) £1.15 View Item. Whole Lotta Shakin' Goin' On - 25 Rock 'N' Roll Hits - Orig Jewel Case & Artwork (#273708225316) £0.79 View Item. HO / OO GAUGE. There are two different lengths of 152 & 165mm. Hornby Trains Sets. 2x LEFT HAND POINTS. Plastic Model Kits. TUNNELS SKALEDALE. Sylvanian Familes. Tamiya RC Cars. Sylvanian Families. PECO SL-96 INSULFROG MEDIUM RADIUS LEFT HAND POINT WITH WORKING MOTOR IN V.G.C.